Sikkim is a place with peace, serenity, history, culture and amazing food. It has everything in a small little place that one can wish for. From here, you can see India’s highest mountain – Mount Kanchenjunga, you can see breath-taking lakes and you can also experience the courage of our Indian soldiers. 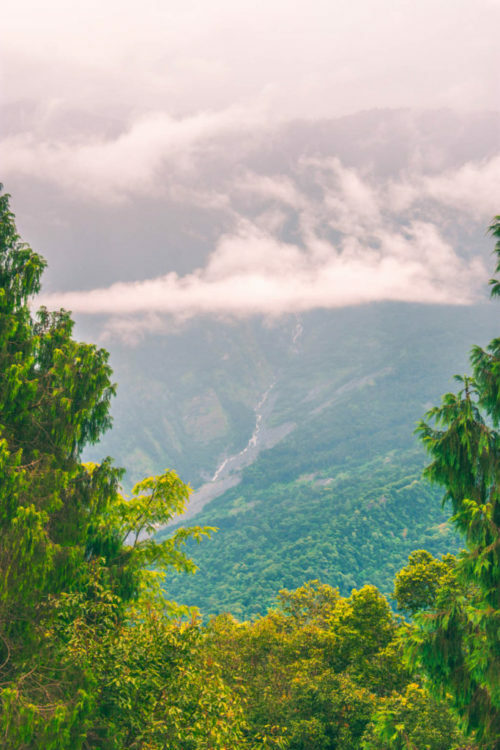 There are numerous places and hill stations to visit in India, but in this article, I will cover some of the hidden gems that you can explore in North Sikkim as well as East Sikkim. I have gone to Sikkim for the second time. My first experience here was my first solo trip to this gorgeous place. This time, however, I went with Our Guest folks. They are amazing yet down to Earth locals of Sikkim that I, fortunately, met on my travel. To tell you the truth, I was not well during this trip. I had a high fever, severe headache and weakness. But the Our Guest folks were always on their toes to take care of me. They did let me feel that I am away from home. 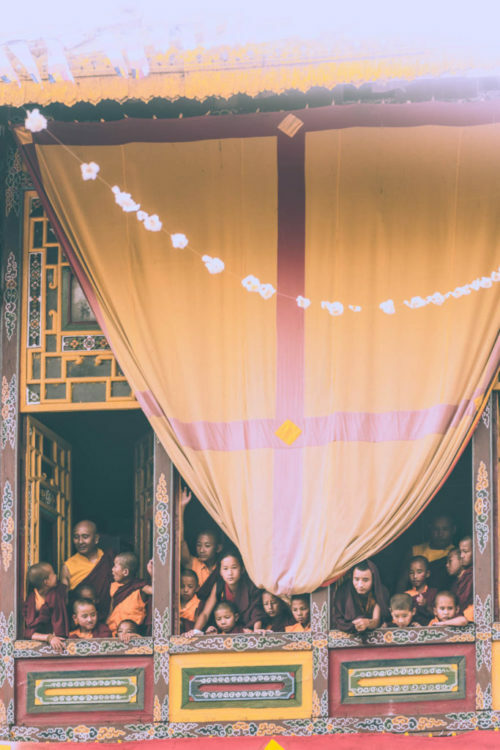 They were courteous, told us several hidden facts of Sikkim (that I would very much like to share with you below), as well as gave us some of the best experiences. I personally avoid group tours or a planned tour, because I feel group trips limit the experiences. But it was different with Our Guest. That was the beauty of their planning. They were friendly, cheerful and flexible with our every need. The map below covers the route we took from Siliguri up to Gangtok and from there towards the hidden places around. This will help you in understanding the route a little better. Below, you will also find a detailed itinerary along with the accommodations in beautiful homestays. To reach Gantgok, the capital of Sikkim, you would either need to take a flight till Bagdogra or Pakyong. Domestic flights to Pakyong are still limited in number as compared to the Bagdogra airport. Below, I will talk in detail of both the routes that can be taken to reach Gangtok, depending on your time and budget. Pakyong airport is not only one of the most beautiful airports in India, but one of the five highest airports in India. The frequency of domestic flights to Pakyong is still very limited. But in my opinion, it will cut down the travel time a lot. The distance between Gangtok and Pakyong is just 30 kms from where you can take a bus or a taxi for Gangtok. In fact, private taxis are also available from Pakyong. The cost varies between INR 1,000 to INR 1,200 per taxi. Below I am summarizing two alternate routes to reach Bagdogra or Siliguri. You can choose either of the two depending on the budget and time. The airport in Siliguri is Bagdogra Airport. Getting flights to Bagdogra is easy and economical as the airport is connected to all the major airports of India. 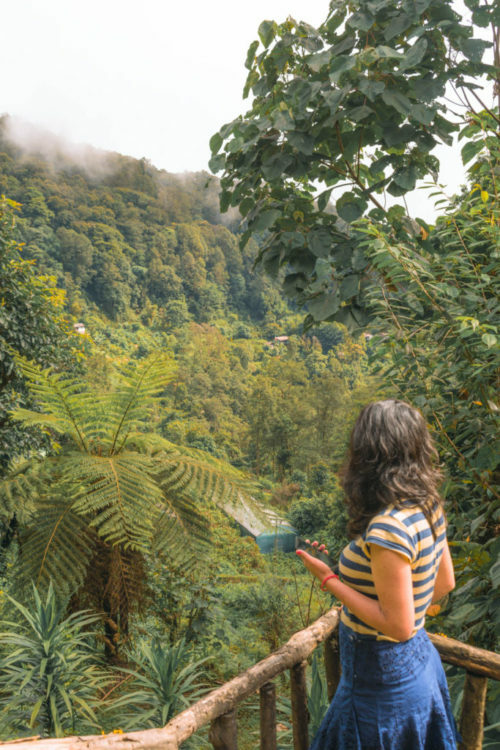 From here, you can take a shared taxi/bus/or a private vehicle to Sikkim. If you have time and budget is a constraint you can reach New Jalpaiguri Junction railway station or Siliguri railway station. Bookings for train tickets can be done on Indian Railways or on irctc.co.in website. Our Guest arranged a private taxi for us. They have this arrangement on both the railway station and also at the airport. So, if you book their tours you don’t have to worry about the transport from Bagdogra/Siliguri to Sikkim. The distance between Bagdogra and Gangtok is about 5 to 6 hours’ drive. While driving from Bagdogra/Siliguri to Gangtok, you will come across Teesta river flowing alongside. Further, you will also cross the first Sikkim check post, which is Rangpo, from where permits are obtained to enter Sikkim and all its restricted areas. If you are travelling in an unregistered Sikkim vehicle, then the vehicle would need to stop at the check post, obtain a permit and then only the cab is allowed to enter. This is generally a few minutes task. However, there are a few cons of these unregistered vehicles which I will cover below. There are regular state-run bus services from Siliguri’s Tenzing Norway bus station. From NJP railway station you can take an Auto Rickshaw and reach the bus terminus in about 10-15 minutes. The frequency of the bus is good as the buses leave after every hour. The state-owned bus services start early in the morning at 8:30 am and the last bus leaves at 3:30 pm. It will cost you only about INR150/- to INR 200/- to reach Gangtok from Bagdogra. There are several private bus services as well that starts only after 2 pm. Although do note that the bus will drop you 2 kms before the Gangtok main market, at Deorali. There are connecting stairs between the road and the Gangtok’s mall market, or you can take a taxi from here. You can also take the private buses, jeeps and taxis which is available at a reasonable rate. As mentioned above, all the unregistered vehicles have to take a permit at Rangpo check post. Further, these vehicles cannot enter Gangtok and that is a disadvantage of these vehicles. They would have to stop at Deorali stand from where you would have to take another taxi, just like the bus services. So it is ideal to take a Sikkim registered vehicle. Although the number of Sikkim registered vehicle is limited and the prepaid counters both at Bagdogra airport and NJP railway station provide only West Bengal state registered taxi. A place that is bounded by Teesta River in its South East and Tholung Chu River in the North East. Dzongu is really green, beautiful and peaceful. The vegetation here is plenty, houses are made of woods and handloom clothes, cane and bamboo products are their speciality. Dzongu is a place that has been specially preserved for the Lepchas community by Chogyal. To reach here, one needs to take a permit. Even Sikkimese need to take a permit. Lepchas have a strong connection with nature and they consider Mount Kanchenjunga as their God. At times, when they have to pray and Mount Kanchenjunga is not visible due to the cloudy weather, they place rocks and regard one of them as Mount Kanchenjunga. The place seems almost untouched. If you explore properly you can witness numerous monasteries, hot springs, waterfalls and rivers where you can take a dive. High in Sulphur content, the waters are believed to have great medicinal properties. Further, in 2016 there was a major landslide in the Mantam Village of Dzongu that blocked the Kanaka River. The landslide caused a vertical dam structure that bifurcated the flow of water. Now, there is a violent flow of water after the river passes through the dam. Gnathang or Gnathang lies in the high altitude of 13,000 feet, amidst the meadows. 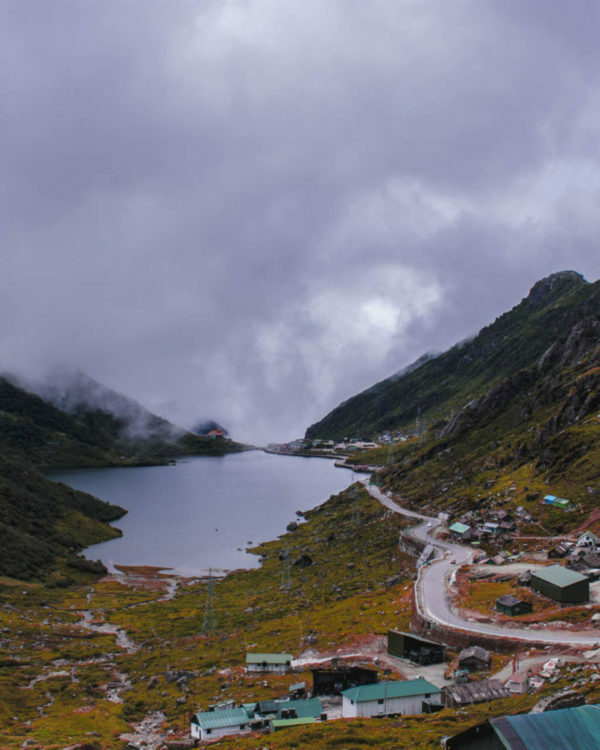 It is also the highest habitable region in Sikkim for tourists. This place is also known as the “Ladakh of East India”. This place lies in the old Silk Route region and is surrounded by several snow capped mountains. During the winters, this place becomes a cold dessert as the temperature falls below sub-zero temperature. In this place, you can find war memorial of ‘Tukla War’. Along with this, there are several monasteries and river streams here along with small bridges which makes this place really quaint and antic. Around Gnathang, there are many places that you can explore. Gnathang is a hub of tourist spots but they are still not known to many people. So you will find both peace and serenity at the same time as the hustle bustle of the tourists is less. Kupup Lake – Also known as the Elephant Lake lies at a height of 14,000 feet. The name is because the lake is actually shaped like an Elephant. Kupup also has a Yak Golf Course which is the highest Golf Course in the world. Adi Baba Mandir – This temple is specially built for Baba Harbhajan who died on duty as an army man. Army officials and local people worship him and the Mandir was built in his memory as all the necessities used by him is placed in the Mandir along with the bed on which he sleeps. Hidden lake – We were taken to a lake near Gnathang and were specifically asked not to reveal its name as Our Guest and several other tour operators are trying to preserve the lake and its surroundings. The place is really RAW and rich with flora and fauna. I really appreciate the efforts of Our Guest folks and not promoting tourism in the name of that lake just to mint money, which is really respectful and nice. But to tell you a little about the lake it is an hour drive from Gnathang and is cradled between rich green mountains. Having lunch here was the best feeling. Zuluk Loops are located near the Indo China border. The curves and pins here are really unique and one of a kind. The zig-zag roads are stretched for three levels and are unparalleled. The best time according to me is during the winters which are between December to March as the entire stretch gets covered with snow. Thambi view point – If you want to see the Zuluk loops at its best, Thambi View Point is the best spot to see the entire stretch. This View Point is at 11,200 feet and is also the place from where you can see Mount Kanchenjunga. The entire stretch from Gnathang to Lingtham is known as Silk Route. This place is full of natural beauty and was one of the cleanest and a peaceful hamlet to be in. It is also a place where you will find mountains, rivers as well as forest. The highlight of Pang Lhabsol is a masked dance conducted by highly trained members of the local community with the support of special monks from the Monastery! The festival was started 3-4 years back. It had fizzled out before but it was revoked at the palace grounds and has been happening continuously for 3-4 years now. This festival is celebrated by Sikkimese to pay homage to Mt. Kanchenjunga, the guardian deity of Sikkim. It was such a vibrant festival and I really admired the performers who wore 4-5 layers of clothing and performed the masked dance in the excruciating heat. Reaching Gangtok takes an entire day! I took a flight till Siliguri and from there I took a cab that was arranged by Our Guest folks till Gangtok. But it does not really matter, the time to reach Gangtok I mean. Because your journey actually starts from Siliguri itself. You cross beautiful meadows and the greenery welcomes you. The weather becomes really pleasant and you can actually feel the difference in the air. At least I did! You will reach later in the evening. Enjoy the surroundings of Gangtok, have food and take rest after the long journey from your hometown. You can explore the Mall Road of Gangtok if you have the energy and time left. The distance between Gangtok and Dzongu is about 70 KMs. We departed early in the morning from Gangtok and it took us about 4 hours to reach Dzongu. The ride is really beautiful, but also bumpy! Really really bumpy actually! We also stopped midway to take pictures of the valley. It is a very picturesque valley overlooking a bridge. We reached Munlom Nature Resort that lies in the lower parts of Dzongu. Munlom means blessing, and I could not agree more. All of us actually felt immensely blessed to be in that place and especially in this resort. The exact location of Munlom Nature Resort is in the Gyathang Village of Dzongu. The resort is built in a traditional way with wood craftings and bamboo coverings. Here you can ask for local wine and cuisine. Our first day was mostly spent in and around Munlom Nature Resort. We went on a hike to the nearby areas where we were also accompanied by Kim, the owner of Munlom Nature Resort. He took us to Ringhem Monastery nearby from where we were able to see the green mountains at a distance and a part of Gyathang Village. The next day we went to the upper areas of Dzongu which is cut off for the past 2 years by a Massive landslide. Our first stopover was to a natural sulphur hot spring known for their medical benefits. It was really refreshing. After this, we were taken to the river side where we had our picnic, as well as explored some nearby footbridge. Also, a thing to note about Dzongu is that the territory is virgin, hence the road connectivity is under development still. Our parts of the drives were mostly on gravel which made our travel a little slower. Permit – Dzongu can only be entered after crossing a huge metallic bridge on the Teesta and to enter here you would need a permit. You can main the details to Our Guest folks and they will get the work done for you. There is a halt in Sanklang where the permit needs to be shown at the check post. In fact, the driver will also need the permit since even Sikkimese are not allowed to enter without it. It is advisable to get the permits done in advance and not on the same day of your visit as it takes a little time. Temperature – The weather is slightly humid as compared to Gangtok. So if you are arriving in winters, of course, you will be needing woollen clothes but then again the temperature would be slightly hotter than in Gangtok. During summers, you would not need woollen clothes at all. ATMs – It is advisable to carry cash with you from Gangtok itself as the ATMs here are in far-off places in Dzongu. Mobile Phones – You will get network connectivity here but the internet is a little slower. In fact, strangely, Vodafone Internet is comparatively better here than other connections. Further, you lose the network connectivity once you are on the other side of the landslide/dam area. From Dzongu we left early in the morning for ‘Pang Lhabsol’. We wanted to reach here as soon as possible as we wanted to avoid the rush and get a perfect spot to shoot. The festival is conducted at the Royal Chapel of ‘Tsuklhakhang’. 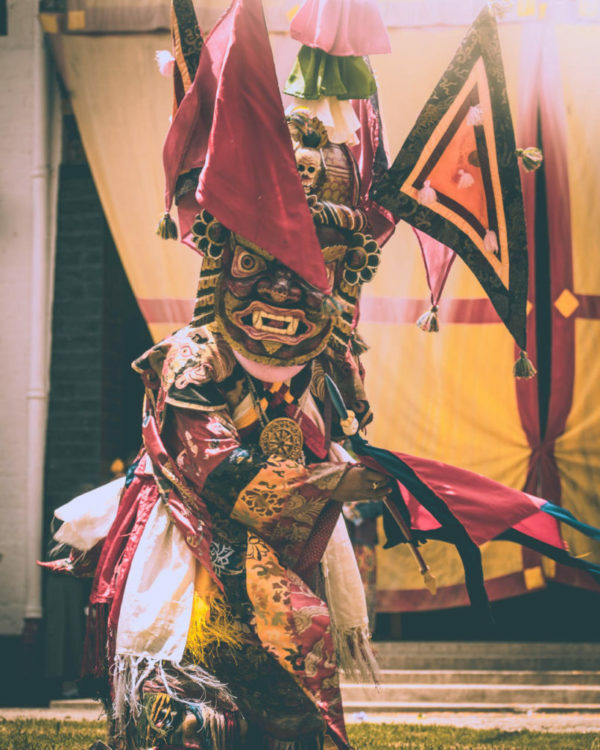 It was one of the best things I have witnessed in Sikkim – vibrant colours, mask dance, prayers of monks to the guardian deity of Sikkim- Mount Kanchenjunga. Post this, we explored MG Road with Our Guest folks where we did souvenir shopping along with trying cuisine in the cute cafes of Gangtok. This cosy hotel has a garden as well as a restaurant. With numerous books kept here so that one can read and understand the culture of Sikkim, the staff is really friendly. While I was sick, they made light food especially for me and took care in the best way. A good hotel is one thing, but having a staff that cares for its customers is another. 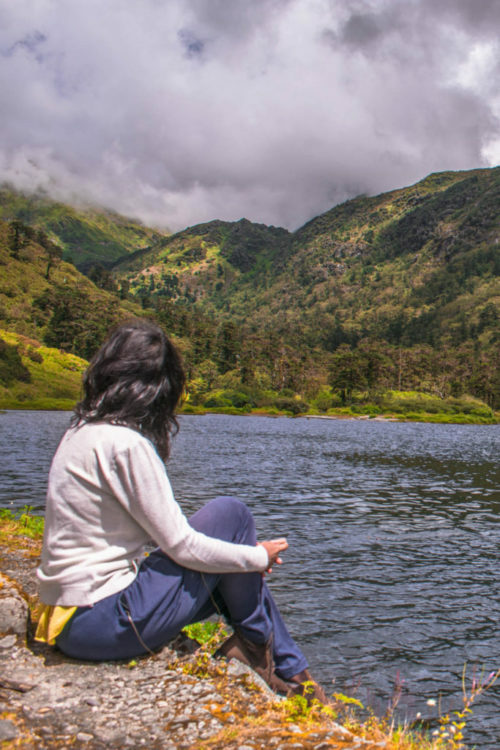 The next day, we left Gangtok at 7 AM to see Tsomgo lake first. Tsomgo Lake is really beautiful where you can do yak ride as well as get into a cable car to get the bird’s eye view. Since we went during the offseason, this otherwise heavily crowded place had no tourists at all. We had the entire place to ourselves. We moved a little ahead to see the Elephant Lake, Kupup village and were taken to a remote hidden lake for a delightful picnic and lunch with ‘Eat Your Heart Out’. The lake was so clean only and only because it is still untouched which I thank the effort of these people who aren’t promoting tourism in the name of such hidden spots. Post our refreshments and taking a stroll inside the forest nearby the lake we headed to Gnathang, when it immediately started pouring. It got a colder here. We were served butter tea by the host of the homestay and we sat beside the heater where we had the most fun-filled evening with light music, chit chat and some best of jokes. Lying in the small hamlet of Gnathang, this homestay gives such a warm and cosy environment. The major reason is that of the family that runs this place. They are really kind, sweet and some really amazing to talk to. From them, you can get to know in and out of Gnathang. They also provide their guest with food, warm water, butter tea as well as amazing service. Permit – Even for Gnathang, one would need a permit to reach here. You can contact Our Guest and they can get the work done for you. Clothing – Carry warm clothes. Once you attain a certain altitude it gets really col, starting from Tsomgo Lake itself. Do carry gloves, cap and woollen clothes. During the month of December to February, the place is loaded with snow. So carry heavy garments during that time. Health – Carry medicines along with you to this place as there are no pharmacy shops here. The nearest health facility/medicine shop is available at Rongli. ATMs – There are no ATMs in Gnathang. It is better to withdraw cash from Gangtok itself. Network Connectivity – The mobile network is really weak here and one hardly gets any cell reception. After breakfast, we went on a little exploration in Gnathang. We went to the War Memorial, crossed several bridges on tiny little streams, walked through the misty weather and got to know the history of the monasteries here. Later we had a conversation with the owner of our homestay on a cup of butter tea where he told numerous things about Gnathang. He told us how the Gnathang’s yak is the best breed because of the constant exchange of these animals between China and India in the olden times, how difficult their lives get during the winters, how their village is fast evolving, etc. After this, we moved towards Lingtham through Zuluk loops. Sadly, we were not able to see the loops due to clouds and mist but the drive through the zigzag road was amazing. It was a magical experience to drive through a very serene environment and enter right inside the forest. It took us about three hours to reach Lingtham from Gnathang and on the way, we also stopped at Zuluk – a quaint village on the old silk route. This was another beautiful homestay, right in the middle of the forest. This homestay has four bedrooms with an attached bathroom. They taught us how to cook momos which were really a different experience for all of us. The homestay is really clean and peaceful and one can spend days here in total peace. It calms your senses because here, you would not get any cell reception and you are away from all the human touch. The homestay is also planning to open a small library for its guest so that they can know about Sikkim or relax here for days. If you plan to visit the homestay, do update me on the opening of their library. Today, leave early in the morning from Lingtham and drive back to Siliguri. The drive will take about five to six hours. You can catch your flight or train as per whichever mode of transport you have booked. I will be honest, planned and group trips I majorly avoid. But again, these untouched places are remote and one cannot go here without a guided trip. At least he hidden lake I talked about above would not have been possible without the Our Guest folks. If you want to explore the best of the best of Sikkim which is still untouched and out of reach for most of the tourists, contact Our Guest. They will make everything customized for you – from plan to stay to itinerary to budget. You can follow them on – Facebook and Instagram as well to get regular updates of their plans. Enter your email address to subscribe to this blog and keep updated with our awesome content. Enter your email address to subscribe to this blog and keep updated with our awesome posts!